Look at this colder progres sion by the GEFS on the twitter link. Wow but we'll see, still think W Bergen County N&W sees snows and the coastal plain sees wet snow flakes at this time. CP is standing on his deck right now, looking Northwest. dkodgis wrote: CP is standing on his deck right now, looking Northwest. Yesterday, the look was better, but as of this morning, NWS has removed any mention of snow with the rains coming in next week. 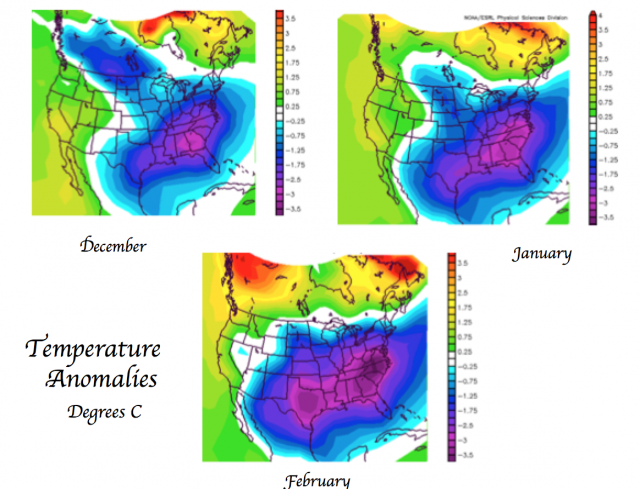 Check out the results of the latest Pioneer model for Dec Jan Feb for temps and precip. 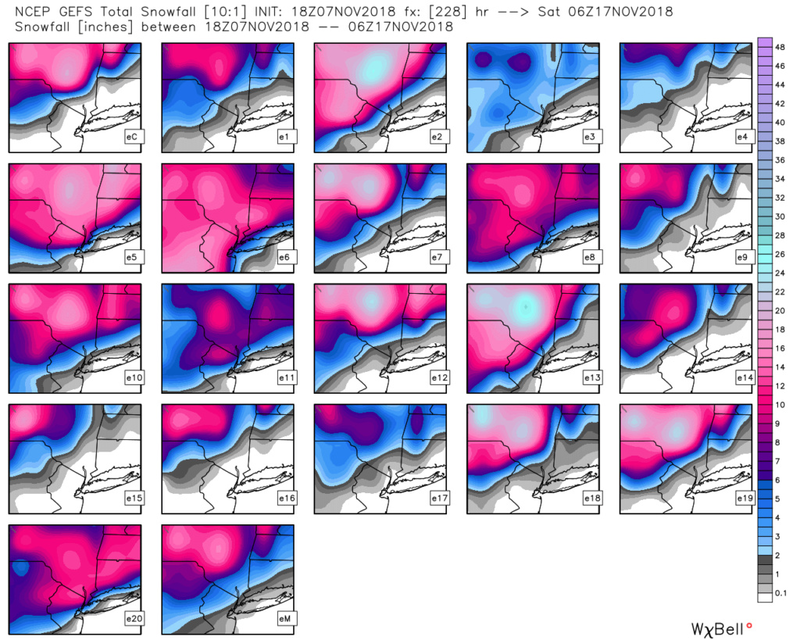 The pioneer model is a long range forecasting tool developed by Joe D'Aleo that incorporates over 20+ or so different factors to come up with a forecast. It has scored very well over the years. 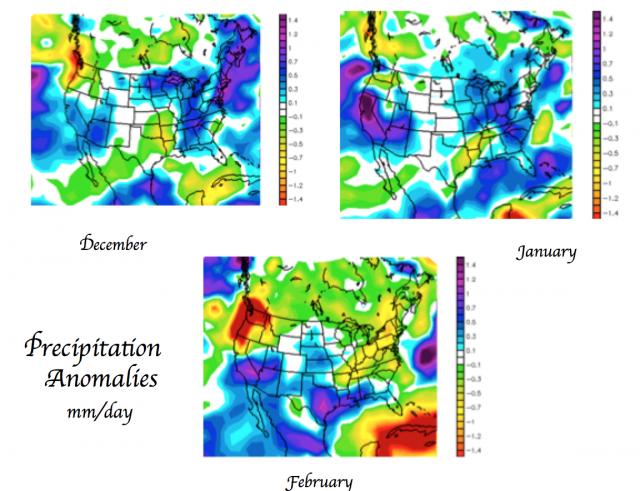 Notice Feb temps vs precip. That look might mean suppression depression with bone chilling temps but little to no snowfall Or it could mean smaller amts of QPF, aka below normal precip, but still decent snow totals due to high ratio events. Obv dont take these images as gospel but it is encouraging to say the least. As long as cold air is in place, we have a chance! That's all I ask, I hate mild winters! I prefer winters with normal temperatures and above average snow.That February map Doc has posted exemplifies the 1976-1977 winter of bitter cold but below normal snow.Can't stand suppression type scenarios like that 'snowmageddon" winter that pounded areas south of here.According to the maps Doc has up there, December looks good, January is 50-50 and February will be a suppression month (ugh). “In my opinion, the potential (wintry) storm threat progged to impact our region early next week will come down to a battle between﻿ latent heat release versus the anomalous snowpack/positive feedback trend occurring in Canada in recent weeks, a﻿s has been discussed ad nauseum by *******. My reason comes from the fact that there is a complete Northern Hemispheric incongruency amongst major features that are all negatively interfering with each other. For example, whilenwe will have a -NAO to work with, we are lacking the presence of a true 50/50 low, which is a combination I like to see. Similarly, w﻿hile we have a great -EPO signal, we are lacking a -AO. Third, our +PNA ridge spike (a dime-piece look of one, I might add) is likely to be offset by the presence of a sustained SOI spike in recent days passed. In addition to all of that, the signal of a -WPO will be countered by a Niño 1.2 spike in the final ten days of October. With the ﻿MJO likely to be a non-factor here (this is all in my opinion/analysis, of course), we have to look at things closer to home to try find any further clues. I posted my thoughts on Tuesday storm in the November thread. I do not see a wintry threat for our area at this time. Right now it looks like next week, after Tuesday's storm, will be below normal then there will be a gradual warm-up into next weekend and the week of the 19th. The warm-up will only bring slightly above normal temperatures. Nothing too drastic because the -EPO will still feed cooler air from Canada down into the eastern CONUS. The medium range weather up to Thanksgiving is not exciting. But once we get to the very end of November into December I think there will be meaningful activity which has the potential to bring us our first snowflakes of the season. The MJO is shown to be in phase 2 then going through phases 3-4-5. This is in line with what we're seeing on the VP200 maps, where blue color shows the tropical wave propagating eastward. These phases typically lead to milder weather for the eastern U.S., and models do show a small warm-up the week of Thanksgiving. 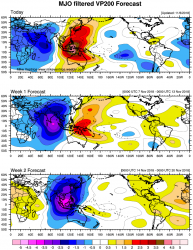 But if this tropical wave is as potent as some of these maps are showing it is possible the MJO enters phases 6-7-8 which would suggest a cold pattern to come late November / early December. Still long ways off. We will see! One coastal low after another reminds me of the 1995-1996 pattern.That one locked in for constant snowstorms. Starting to get excited as we get closer to the start of meteorological winter which begins on December 1st. We have a textbook southern jet which exits the GOM and rides up the eastern seaboard. The MJO looks to remain in favorable 8-1-2 mode for the majority of winter with only brief warmups being felt as per the colder waters being seen in the Indian ocean. That equates to frequent winter storms for us as well as our mid Atlantic and New England neighbors. The only question remains is how much of a -NAO do we see? That will be the determining factor between moderate and major events. There's no doubt we will rival 95-96 with blocking in place. All the talk of 96/96 similarities has me pretty damn excited. I’ve referenced that winter on here many many times. All time favorite winter from a snowfall perspective. NOTHING ELSE HAS EVEN COME CLOSE. I’m pretty sure we had 17 snow events of 3” or more for our area that Winter. I wound up with over 90”. 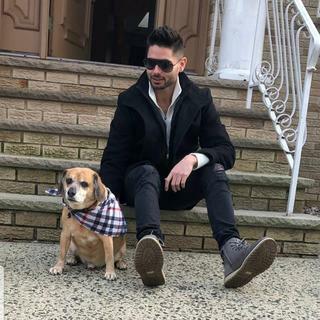 I was living in Bellerose at the time on the Nassau/Queens border. I'm always hesitant to get my hopes up for significant snow. If memory serves, the geography of my area helps lead to the energy transfer that creates Miller B systems. (I'm probably wrong here, but I think it involves vertical stacking). As for the coastal systems, I'm too far inland the vast majority of the time. A storm that drops 6-8 here is considered huge. For teh coastal plain and LI they may see a mix but its mostly rain. Don't underestimate teh CAD signature and that these Southern Storms have come in faster the progged even by a few hours it would be a huge difference in the Ptypes.